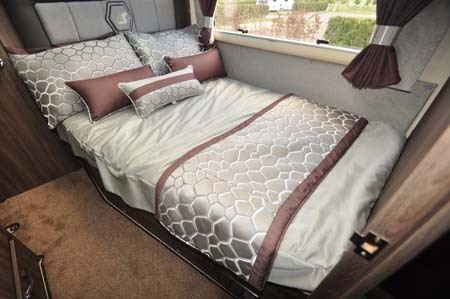 2016 Auto-Sleeper Corinium FB motorhome: the £64,000 answer? This isn’t the first occasion Auto-Sleepers has dabbled with a coachbuilt motorhome on an Al-Ko chassis, but there’s a definite sense that this time it really means business. Meet the forerunner of what will be a three-model Corinium line-up, the essential differences being the sleeping arrangements. The FB here is a French bed arrangement – soon to follow are island bed and twin single bed variants. But Corinium definitely fills a gap in the Auto-Sleepers portfolio – and there’s no doubt folk will be making comparisons with this and the far pricier Mercedes-based coachbuilts it offers (it’s the Burford that’s a direct alternative to the Corinium FB). In that respect, a good place to start is ride and handling. 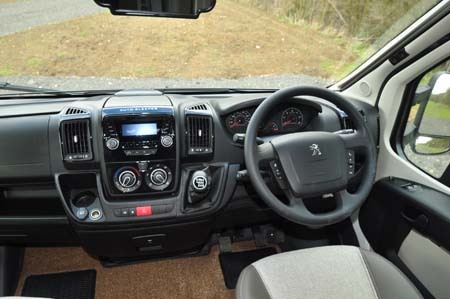 Only a test drive can confirm what’s best for you, but the combination of Peugeot’s Boxer cab and Al-Ko’s chassis will more than suffice for most people – it’s a firmer ride that handles cornering particularly well. It’s good to see, too, that the standard engine is the slightly more refined 150bhp unit. 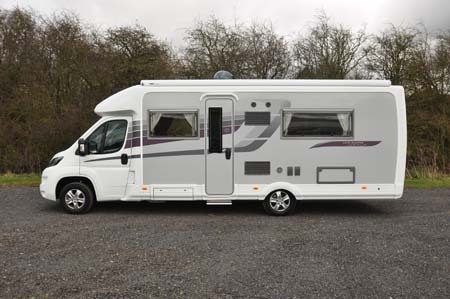 Plus a colour reversing camera will help to keep accidental knocks and scrapes to a minimum and will save on your motorhome insurance with Caravan Guard. Compromise simply doesn’t feature in the Auto-Sleeper lexicography. Nevertheless, £64,000 is a more appropriate price for this vehicle once you’ve factored in the Premium, and Winter Pack options, at £2,500 and £295. That still leaves you with the choice of a Media Pack, for a further £995 – a Maxview VuQube II automatic satellite system, with twin LNBs supporting two receivers, compatible with SD/HD free-to-air satellite receivers. Actually, there are some aspects where Auto-Sleepers has held back. It’s determination in keeping the standard Corinium FB on a driving-for-all 3,500kg chassis is admirable, but it leaves payload a little bit tight. Essentially, though, this is a two-berth. OK, the settees can be pulled together to make a transverse double bed, but that really is just for occasional use. The main sleeping area is a fabulous full enclosed bedroom where a French bed sits along the nearside and a huge wardrobe with lower-level drawers take up most of the offside. It also leaves just enough space for a handy “vanity area” with mirror just by the door to the washroom. As you’d expect, having the washroom across the whole width of the back end means plenty of space. 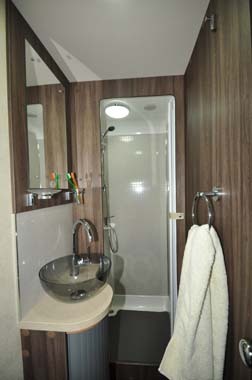 A “salad bowl” basin with swan-neck tap takes centre stage, with a full shower cubicle on the nearside corner and Dometic ceramic swivel-bowl toilet plus window on the offside. There will surely be few complaints about the kitchen. Cooking facilities include a Thetford Caprice cooker with dual-fuel hob and a Daewoo microwave oven. There’s an extractor unit overhead. The Dometic fridge/freezer has automatic energy selection and a 190-litre capacity. There’s plenty of storage and worktop space, including a slide-out extension. 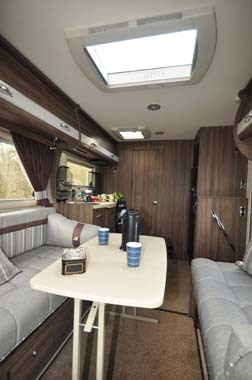 The front end is all lounge – here in standard twin settee/swivel cab seats format, all served by a free-standing table. Heating and hot water are catered for by Truma’s more powerful Combi 6 system, with a Drive Safe regulator meaning it can be used on the move. There are plenty of details to note, too. It’s a flat floor throughout. The bodywork is GRP-clad with flush-fitting windows. Cab fittings include a digital stereo radio. Lighting throughout is generous, all-LED, and there’s a 105ah leisure battery. True, you can order your Corinium with an alternative lounge that offers a forward-facing travel seat for two. Indeed, you can also specify an overcab pod to add to the bed offerings. Plus, there’s still a bit of flexibility to the way Auto-Sleepers produces its motorhomes. There’s a no-extra-charge choice here between a spare wheel and a Fix ‘n’ Go kit, for example – bearing in mind the former isn’t particularly easy to access and takes a bit of weight from the payload. There’s a choice of six upholstery colours across two styles – new Catalan or established Moonstone. You’re also welcome to discuss aspects like mains sockets, even smaller details like the location of the kitchen roll holder. Yes it looks a nice van, but many other vans in this price bracket or even cheaper would outshine it or give it a run for the money. Agree with others that the payload is not enough for a van of this size. The Alko chassis is a winner though. would fit my bill other than the payload which is a bit on the low side. Very nice van, disappointing payload.